The number of cancer cases in Scotland is projected to rise by 33% between 2008-2012 and 2023-2027. Much of this increase can be attributed to an ageing population but for some of the most common cancers there appears to be a gender story emerging. The age-standardised incidence rate per 100,000 population for males is projected to remain fairly stable with only a slight rise between 2008-2012 and 2023-27. For females, the rate is projected to increase from 590 per 100,000 population in 2008-12 to 650 per 100,000 in 2023-27. Lung cancer is the commonest cancer in Scotland with 25,475 new diagnoses between 2008 and 2012. New cases of lung cancer are projected to increase by 20% between 2008-2012 and 2023-2027. However, for females, the percentage increase is predicted to be 29% (compared to 12% for males). The number of cases of lung cancer in females is predicted to be more than in males for the first time in 2023-17. Smoking is the principal cause of lung cancer. It is thought to be responsible for 85% of cases. This gender imbalance is thought to mirror the smoking patterns of the population with male smoking having seen a decline over recent years but there has been a rise in women smokers. Cancers of the head and neck is the fifth most common type of cancer in Scotland. 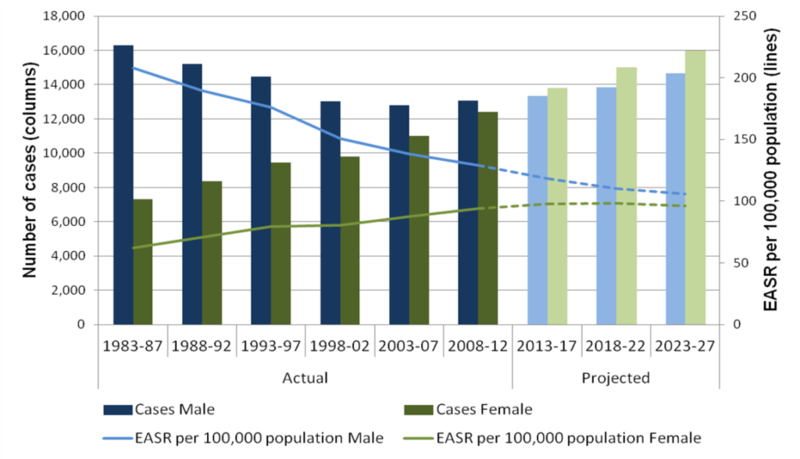 The number of new cases is projected to increase by 37% between 2008-12 and 2023-27, however, the projected increase in females (57%) far outweighs the 28% predicted increase for males. The age-standardised incidence rate is also projected to increase for both males and females over this period, but the increase in the rate for females is expected to be larger than for males (6% increase for males and 31% for females). This may again be a reflection of the changing culture in women’s drinking and smoking. The evidence that alcoholic drinks are a cause of cancers of the mouth, pharynx, and larynx is convincing. The risk is multiplied when drinkers of alcohol also smoke tobacco. Non-starchy vegetables, fruits, and also foods containing carotenoids probably protect against these cancers. It has been estimated that up to half of these cancers are preventable by appropriate diets and associated factors. Similarly, cancer of the kidney is projected to rise by 85% in women compared to 63% in men. Smoking is a cause of kidney cancer. Both current and former smokers have an increased risk of renal cell cancer compared to people who have never smoked. 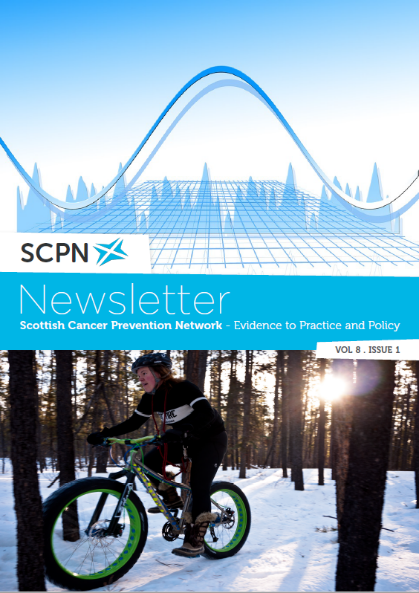 The Continuous Update Project  also concluded that there was convincing evidence that greater body fatness is a cause of kidney cancer and estimated that about 19% of kidney cancer cases could be prevented in the UK if everyone had a healthy weight. 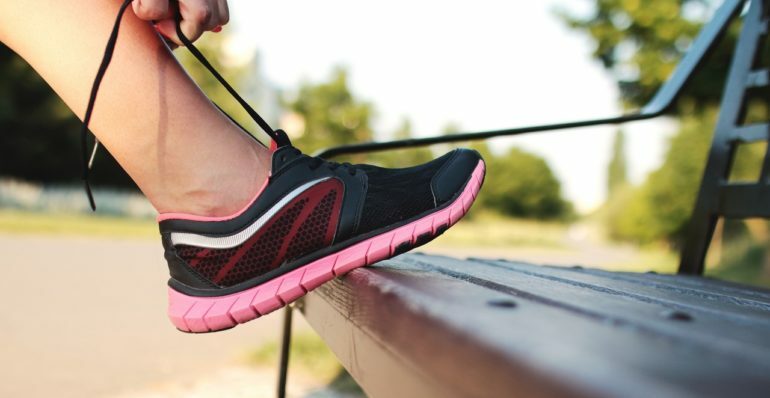 Women have lots to gain from making lifestyle changes to lower their risk of cancer and we as policy makers, health professionals, cancer charities and academics all have a role to play in facilitating and supporting that change. Cancer Incidence Projections for Scotland 2013-2027 (2015), Information Services Division, NHS National Services Scotland.